THE LEBANESE Parliament is ready to ratify an agreement on the exclusive economic zones (EEZ) between Cyprus and Lebanon within a fortnight from the moment the EEZ dispute between Lebanon and Israel is settled, said Speaker of the Lebanese Parliament Nabih Berri yesterday. Berri was on an official visit to Cyprus yesterday, where he met with President Demetris Christofias, House Speaker Yiannakis Omirou, Foreign Minister Erato Kozakou-Marcoullis and Commerce Minister Praxoulla Antoniadou. Speaking at a joint press conference with Omirou, Berri said the aim of his visit to Cyprus was threefold. First, to explore what was preventing Cyprus from acting as a bridge between Europe and the Arab world via Lebanon. Second, to discuss the issue of Lebanon’s water reserves under the seabed, which the two countries could exploit, and third, the issue of the day, natural gas and energy. Cyprus has signed agreements on its EEZ with Egypt and Israel, as well as Lebanon, though the latter is pending ratification by the Lebanese parliament. 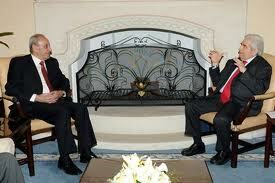 Berri highlighted that the problem was not between Cyprus and Lebanon but between Lebanon and Israel. He accused Tel Aviv of trying to exploit the sensitivities in the area and relations with Turkey, in order to benefit from an area of 850 square km between Israel and Lebanon waters. Asked when Lebanon might ratify an agreement between Cyprus and Lebanon on their respective EEZs, he said, if the dispute with Israel is settled, “I can assure you that at most within 15 days, the agreement can be ratified”. Lebanon claims Israel’s Leviathan gas field, discovered in June 2010, spills over into Lebanese territory, and says that Israel ignores this fact. The two countries dispute an area of around 850 square kilometres. 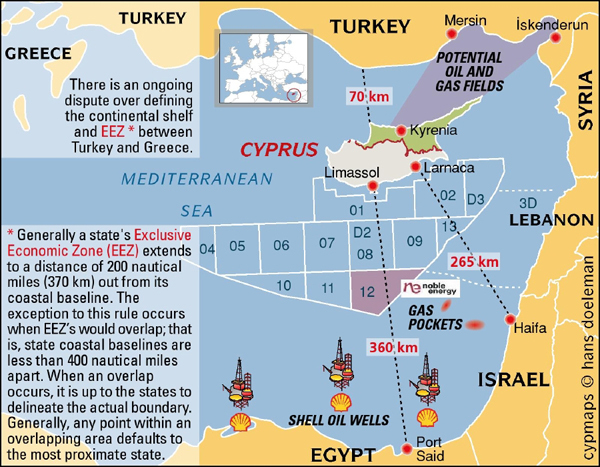 Cyprus and Israel signed an agreement in December 2010 that defines their maritime borders and allows the two nations to proceed in searching for energy sources in the eastern Mediterranean. That same month, Lebanon handed over to the UN the coordinates of their EEZ following the completion of a government-commissioned study. In 2010, Lebanon addressed a letter to US company Noble Energy, which is drilling Israeli gas finds, and has a Cypriot offshore concession, saying it would not tolerate any violation of its sovereign rights and resources. Turkey has also strongly objected to the agreement saying it has rights and interests in the area. In June last year, Lebanon’s Foreign Minister Adnan Mansour said his country had lodged a complaint with the UN regarding the delineation of EEZs between neighbouring Israel and Cyprus. Graphic map outlining the disputed sea border zone between Israel and Lebanon. Lebanon warned the United Nations last December that Israel's proposed sea border threatens peace and security, as tensions rise between the neighbors over offshore oil and gas reserves. Mansour is part of a Hezbollah-dominated government that took office that same month after Lebanon went for months without a working government. Local news reports suggested at the time that Turkish pressure was behind Beirut’s tougher stance. Berri is the leader of the Amal Party in Lebanon and a Shi’a Muslim. By custom, the Parliament Speaker must be a Shi’a Muslim, the President a Maronite Christian and Prime Minister a Sunni Muslim.